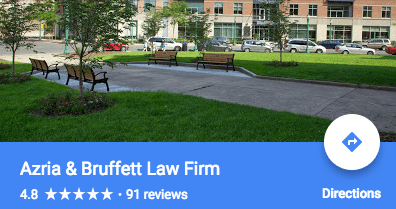 Azria & Bruffett provided excellent representation for my 89-year old father who was charged with two tickets in Cortland, NY. For a very affordable fee, they were able to obtain dismissal of the moving violation resulting in a very small fine and court costs. I live in another state so this was especially convenient for me to help my dad and they saved me a lot of time. We spoke with an attorney and a paralegal (Monica) guided my dad and I through the remainder of the process. The firm responded to all of my questions promptly. Highly recommended. A million thanks for an outcome you can only pray for. Mr. Habib could not guarantee a perfect result, but yes indeed he got me a beyond perfect result. Very professional office (thanks Monica) seamless communication via email and phone. MR HABIB AND STAFF ARE A MUST CALL IF YOU NEED A LAWYER! Ralph and his very capable staff brought what could have been a disastrous speeding ticket-and-point incident down to a parking violation with no points. From start to finish, his office handled everything and came through for me. I hope I don't need him again -- but if I do, I will hire him without hesitation! ...These are the words I use to describe Mr. Ralph Habib. If you are ever charged with a DWI, or any other criminal charge for that matter, Ralph is lawyer you NEED to have representing you! I was charged with a serious DWI offense, at a very bad time in Central New York considering other high profile DWI cases being publicly followed/broadcast. A friend of mine recommended Ralph, and I knew from the first time we spoke that Ralph was the lawyer I wanted fighting for me and representing me in Court. Even though the cards were stacked against us, Ralph listened to my side of the story and understood that I am not a criminal, but that I had made a poor decision. He assured me from the very beginning that he would work tirelessly to get the best possible outcome, and he answered all of my questions along the way. Due to his past work as an Assistant DA in Onondaga County, Ralph has the knowledge and connections needed in this type of case. This charge could have easily ruined me as a person, as well as the career I have worked so hard towards, but because Ralph believed in me and fought for me (at all hours of the day/night I might add), he was able to get my charges greatly reduced. I was able to keep my driver's license, which essentially saved my career and my future. I am forever grateful to Ralph for all he has done for me! I will never be able to fully repay him for the effort he put into this case. And to anyone reading this that is in a similar situation to the one I was in, please know I hope your case gets a favorable outcome as well...if you have Ralph Habib standing next to you, there is no doubt in my mind you will be fine! I had a ticket that I didn't know how I was going to get taken care of but then the Azria Law Firm was able to get it reduced and resolved for which I was very grateful. I'm Canadian, got speeding ticket for driving 74 mpg in the 55 zone. Mr. Habib and staff reduced it to no points and less fine. Pleased with service and outcome. Would recommend it. Ralph is very professional in handling my case. He walked me through the process of my speeding ticket,I am very pleased with the outcome.Thank you so much! I called Seth Azria when I needed help with several tickets. He was very helpful, knowledgeable, and was able to help me out significantly in getting several charges reduced and cancelled. I would most definitely recommend his services to anybody in need of assistance. His services are very reasonably priced as well. I got a speeding ticket in the wonderful state of NY. (I live in Texas) I called Seth Azria and he was the best attroney I have ever dealt with just a great guy. He got my ticket reduced to a parking ticket with no points and his fee was very affordable. I will def use him again for any other instance I may need.I travel to Ny from time to time. I def recommend him worth every Penny. Professional, quick and both tickets dismissed. Very pleased! Fantastic, quick and efficient! They made the whole process of dealing with my traffic tickets easy, couldn't be more pleased! Being from out of state, I was happy to find a law firm that was so easy to work with. They were able to get my ticket reduced and they did all the leg work for me. Everything was very straight forward and easy to understand. Hopefully I won't need them in the future but if I do, I know where to turn! Azria & Bruffett (Seth, Habib and Monica) represented my case for a speeding ticket. I am so thankful for all of their hard work and expertise in helping me resolve this issue. They always responded to my communications in a speedy manner. It would be my pleasure to recommend their firm to others in need of legal service. Once again, thank you for your awesome representation! !